Bluegrass music is a form of American roots music. It has its own roots in Irish, Scottish and English traditional music. It is usually played using acoustic musical instruments, and electronic musical instruments are rarely used in bluegrass music. Traditional instruments used include the banjo, mandolin, guitar and bass. Other instruments such as the dobro are also used. 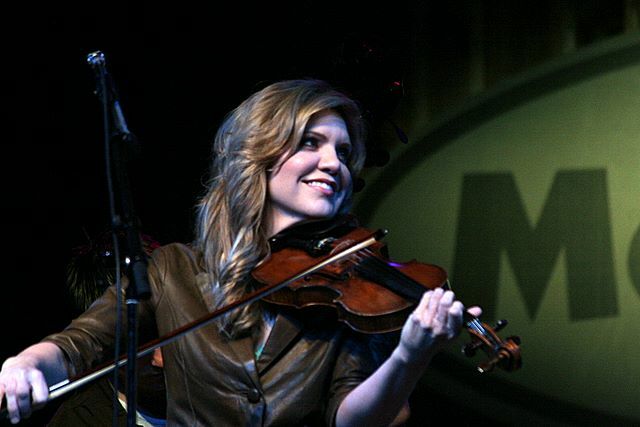 There are many accomplished bluegrass artists including Bela Fleck, Tony Rice, Alison Krauss, Laurie Lewis, Sam Bush, Bill Monroe, and Earl Scruggs. There are many organizations devoted to this music such as the International Bluegrass Music Association (IBMA). Many festivals are held around the country where professionals perform, amateurs gather to play, and workshops are given. The guitar is now most commonly played with a style referred to as flatpicking, unlike the style of early bluegrass guitarists such as Lester Flatt, who used a thumb pick and finger pick. Banjo players often use the three-finger picking style made popular by banjoists such as Don Reno and Earl Scruggs. Fiddlers frequently play in thirds and fifths, producing a sound that is characteristic to the bluegrass style. Bassists almost always play pizzicato, occasionally adopting the "slap-style" to accentuate the beat. A bluegrass bass line is generally a rhythmic alternation between the tonic and dominant of each chord, with occasional walking bass excursions. Instrumentation has been an ongoing topic of debate. 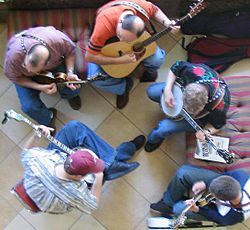 Traditional bluegrass performers believe the "correct" instrumentation is that used by Bill Monroe's band, the Blue Grass Boys (mandolin, fiddle, guitar, banjo and bass). Departures from the traditional instrumentation have included dobro, accordion, harmonica, piano, autoharp, drums, electric guitar, and electric versions of other common bluegrass instruments, resulting in what has been referred to as "newgrass." Bluegrass, as a distinct musical form, developed from elements of old-time music and traditional music of the Appalachian region of the United States. The Appalachian region was where many English and Ulster-Scots immigrants settled, bringing with them the musical traditions of their homelands. Hence the sounds of jigs and reels, especially as played on the fiddle, were innate to the developing style. Black musicians infused characteristics of the blues to the mix, and in a development that was key to shaping the bluegrass sound, introduced the iconic banjo to the region. Bluegrass music Facts for Kids. Kiddle Encyclopedia.